Recently, the Food and Drug Administration (FDA) proposed a redesign of the nutrition facts panel that we’ve grown accustomed to seeing on packaged, bagged and boxed foods. The label that we’re familiar with was designed and put in use over 20 years ago. A lot has changed since then! Portion sizes would get a reality check and reflect the way most of us eat these days. The old ones were based on serving sizes reported in the 1970s and 1980s. Who eats a measly half-cup of ice cream? Who drinks only half of a 20-oz soda? Who stops at 9 or 12 or 16 chips or crackers at a serving? With the change in portion sizes, the calories per serving would also be updated—meaning, they will get bigger both in the number of calories you’re consuming with your portion/serving and in the size of the calorie count on the label. This is super important, because we as consumers need a better sense of how many calories we are actually eating every day. Calorie intake drives fat gain or fat loss. Many of us are eating way more calories than we think we are, the scale is moving upward and we’re left wondering why. Manufacturers would be required to tell you how much added sugar is in the food. This is a big deal because right now, sugars are lumped together. So, it’s hard to tell how much NATURAL sugar is in the food and how much ADDED sugar is in the food. Yogurt is a good example. If it’s made from milk, it has natural sugar. Plus it has whatever the manufacturer has added to it. 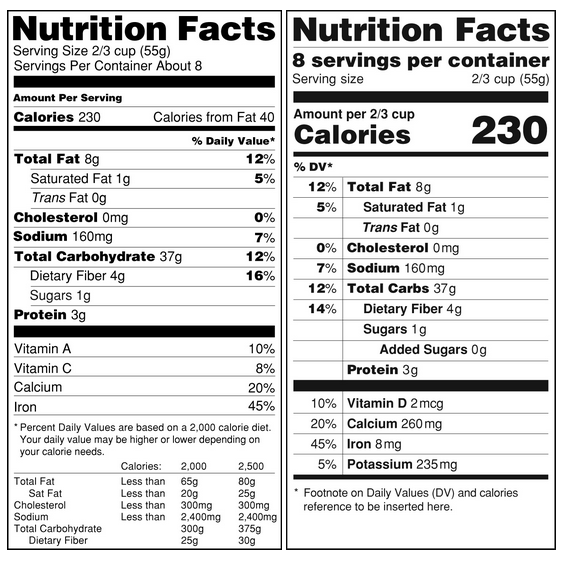 For packages with more than one serving in them, there is a new dual-column label proposed that would show you the nutrient information for a single serving, and for the entire package. Potassium and Vitamin D content would be required. Vitamin A and C can be listed voluntarily, which is fine since Americans seem to get enough of these two. Most of us are short on Potassium and D.
Some of the % Daily Values—which indicates how much of a nutrient you’d get from that food in a single serving relative to the daily recommended amount—would reflect more recent science. Calories from fat would be removed, since the more pertinent info you should be paying attention to is the KIND of fat that’s in the food. Monounsaturated and polyunsaturated good, some saturated fine, trans fat not okay. 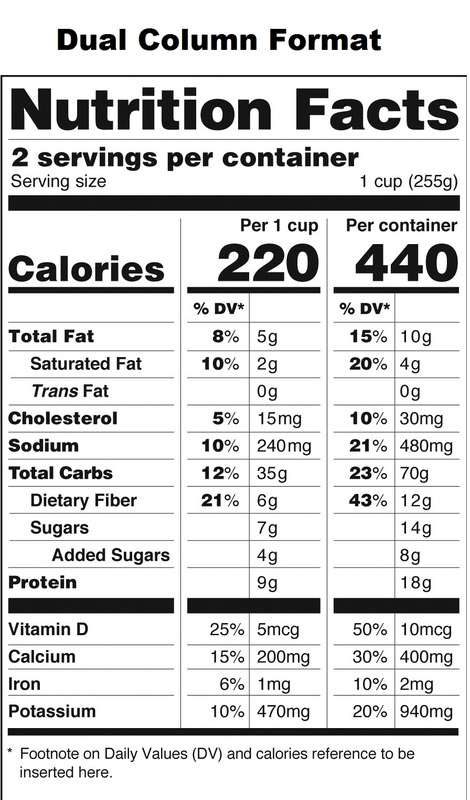 And finally, the design will emphasize calories, serving sizes and % Daily Value. Caffeine content. As more products add caffeine to the ingredient list, it would be great to know how much you’re actually ingesting—especially since the recommended maximum daily intake is 200 mg and it’s pretty easy to get over that. Ingredients list. The FDA didn’t touch this list. That’s a shame, because you shouldn’t buy a product solely on the nutrition facts panel. Food companies game the system by using crappy ingredients and then fortifying the products with vitamins and minerals. In other cases, calories are reduced by adding artificial sweeteners. It would also be nice if controversial ingredients were highlighted, such as artificial sweeteners, artificial colors, high-fructose corn syrup, azodicarbonamide, BHT and others. The ingredients list is a MUST read when choosing healthy options. Country of origin. The USDA does a semi-reasonable job of ensuring the safety and quality of our food supply, but there is almost no oversight on imported foods. China and other countries don’t have a good food safety record. American consumers should know if their product has been made with ingredients from abroad. Produce and meat/poultry/fish are about the only products that include country of origin info because they have to. The rest of foods in packages, boxes and bags? Your guess is as good as mine in terms of where the ingredients came from. GMO information. This stands for genetically modified organism, and there are a ton in our food supply. You have the right to decide if you want to buy a product that is made from ingredients whose DNA has been altered in a lab by genes from other plants, animals, viruses or bacteria. For example, genetically modified corn contain a pesticide that can’t be washed off. Most GMO food grown in the U.S. is “Roundup Ready,” meaning it can withstand spraying of Monsanto’s Roundup pesticide and live, while weeds around it die. Marketers estimate that upwards of 70 percent of the processed foods in your local supermarket contain GMO ingredients. California tried and—unfortunately failed—to pass Prop 37 which would have required labeling foods containing GMOs. The most GMO’d crops in the U.S. are corn, soy and cotton, according to the USDA. Think about how many foods you eat contain corn, soy or derivatives of either of those. I make it my personal mission to stay away from soy and corn as much as possible. The new labels would also be a bit less cluttered than the ones we’re used to. Here’s a side-by-side comparison. And here’s an example of the dual column layout showing info by single serving and by entire package. When Will You See the New Label in the Store? I’m bummed that it will be a while before we see these new labels showing up on foods we buy. The FDA is in their 90-day comment period now. You can weigh in on the new label design if you want to by clicking this link. You can bet the food industry will be weighing in on it as well—and their comments will of course reflect their interests and not necessarily yours. The new labels are larger than the old ones and can be considered “ugly.” Since they take up more space on the package, there will be less room for distinctive branding images and information. The government is prioritizing health concerns for aesthetics and marketing concerns. A smart move in my book. But somehow I doubt the food industry will agree. After the comment period closes, there will be some wheeling and dealing until the FDA comes out with its final regulatory decision. From that point, manufacturers will have two to three years to implement it. All told, it could be up to four years before these new labels make it onto your food. And to hopefully improve your food at the same time (fingers crossed). Studies show that people who read and understand nutrition labels—and choose healthier foods because they do this—have an average body mass index 1.49 percent lower than people who don’t. But, not enough of us have these skills and put them to use. The Agriculture Department conducts studies to see how many working adults use the nutrition facts panel all or most of the time to select foods. Based on the results from 2009-2010, recently released, 42 percent said they did. This is up from 34 percent two years earlier. I want that number to be closer to 100%. And I want you to be the best damn label detective you can be—able to see past all of the hype and sneaky techniques manufacturers use to label the more than 40,000 products currently appearing on your supermarket shelves in the hope that you’ll buy them. Thousands more products are introduced every year. So, I’ve dedicated an entire chapter in my upcoming book, Flat & Happy: Your Guide to a Flat Belly & Happy Body for Life, to food labeling. It covers everything you need to know about the nutrition facts panel, front-of-package labeling and so-called health claims you’ll see all over packaging. It will also help you learn how to interpret the ingredients list to see how much added sugar a food might have, whether or not there is actually any trans-fat in that product even though the label says 0, and whether claims like whole grain are actually true. What is your opinion of the proposed label designs? Do you read labels now? Do you use them to make food choices? Tell me in the comments.